Pull contact information of CPA professionals with the help of our email database. 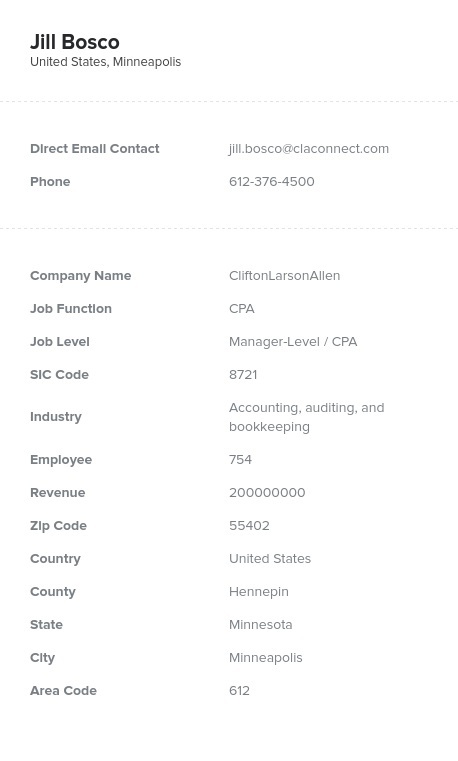 This pre-built list can be integrated into your CRM in minutes and contains the name, phone number, and address for each CPA. Email marketing is easier than ever when you have accurate data you can count on! Does your campaign rely on being able to deal directly with a certified public accountant, or CPA? Email lists from Bookyourdata.com allow you to cut through all of the red tape and get the direct contact information you need. For instance, we only include direct emails, not generic ones like "[email protected]" With this database, you'll have a consolidated list of numerous professionals across industries who serve as their company's CPA. Email addresses allow you to conduct better CPA email marketing campaigns, but we also provide you with enough information to conduct mail and cold-calling campaigns as well. Rarely can you find so much data in one CPA mailing list at such an affordable price! CPAs are key decision-makers at many companies, responsible for advising on finance and business strategies. Their influence and reach make them the perfect candidates for B2B email marketing. CPA professionals are certainly important potential sales leads to reach out to, so make sure you buy a highly qualified CPA email database that contains accurate information and can be used easily with your current CRM. With Bookyourdata.com's email lists, you can have all of that: a human-verified, easy-to-implement database. Download this ready-built list of CPAs to email leads right away, or target your list further with our customization tools!